Tuesday 31st July 2018 – 9am – Jamie Arrowsmith. A man has died and seven others required transporting to hospital after receiving treatment from ambulance staff at the scene of a two-car RTC yesterday afternoon. West Midlands Ambulance Service was called to the A454 in Worfield, Bridgnorth, at 4.44pm and sent five ambulances, four paramedic officers, a BASICS doctor and the Midlands Air Ambulances from Cosford and Staffordshire, as well as the Welsh Air Ambulance, to the scene. An off-duty student paramedic stopped to offer assistance at the scene as did an off-duty doctor and an off-duty nurse. A West Midlands Ambulance Service spokesman said: “On arrival, crews discovered eight patients. “One of whom, a man, was found to be in cardiac arrest with CPR already being performed. “Ambulance staff took over and administered advanced life support but sadly it became apparent nothing could be done to save him and he was confirmed dead at the scene. “A man in his 20s was treated for leg injuries and facial injuries. He was immobilised and given pain relief and airlifted to Queen Elizabeth Hospital, Birmingham. “A 19-year-old-man was treated for leg injuries. He was also immobilised and given pain relief before being airlifted to New Cross Hospital. “A third patient was airlifted, a man in his 40s, who was treated for a back injury before being flown to Shrewsbury Hospital. “Crews treated a man in his 30s for arm and leg injuries before transporting him to Russells Hall Hospital whilst a man in his 20s was taken to the same hospital with leg and facial injuries. Monday 30th July 2018 – 8:15pm – Murray MacGregor. A man has died after a crash on a motorway involving two lorries and a van. It happened ono the northbound M5 at junction 5 at around 3.15pm on Monday afternoon. A West Midlands Ambulance Service spokesman said: “On arrival, ambulance staff found a van that had suffered severe damage after getting caught between the two lorries. “Sadly, it quickly became apparent that nothing could be done to save the van driver and he was confirmed dead at the scene. “The driver of the front lorry, a man in his 50s was assessed at the scene for knee pain and shock but was discharged. Monday 30th July 2018 – 9.20am – Murray MacGregor. A woman has died and two men have suffered serious injuries after a two car crash. The incident happened at about 8.25pm on Kingsland Road in the Kingstanding area of Birmingham. “A woman and a man were in the first vehicle. The woman was rapidly extracted from the vehicle and resuscitation carried out along with advanced life support, but sadly it was not possible to save her and she was confirmed dead at the scene. “The driver in the car initially had a reduced level of consciousness and was trapped for a short period. Firefighters removed the roof to allow ambulance staff to extricate him. “He had suffered multiple injuries, though he regained full consciousness while being treated. He was immobilised and had a pelvic binder put in place before being taken on blue lights to the major trauma centre at Queen Elizabeth Hospital Birmingham. “A man in his 20s from the Audi involved in the crash suffered multiple injuries. He was anaesthetised at the scene and was immobilised before being taken on blue lights to the same hospital; the doctor and critical care paramedic travelled with the ambulance crew. “A woman who was at the location but was not from either of the cars was also treated at the scene after becoming unwell. She was discharged at scene. Friday 27th July – 9.15am – Jamie Arrowsmith. Five people have been injured and taken to hospital following a motorway collision involving two lorries and a car this morning. West Midlands Ambulance Service was called to the southbound carriageway of the M6, between junctions 15 and 14, at 4.35am and sent four ambulances, two paramedic officers and a BASICS doctor to the scene. A West Midlands Ambulance Service spokesman said: “Crews arrived to find five patients requiring treatment following the collision. “A teenage boy, who had been travelling in the car, received treatment at the scene for serious injuries before being transported to Royal Stoke University Hospital on blue lights and sirens. “Two further children, a boy and a girl, were taken to the same hospital with less serious injuries. Friday 27th July – 8.45am – Jamie Arrowsmith. 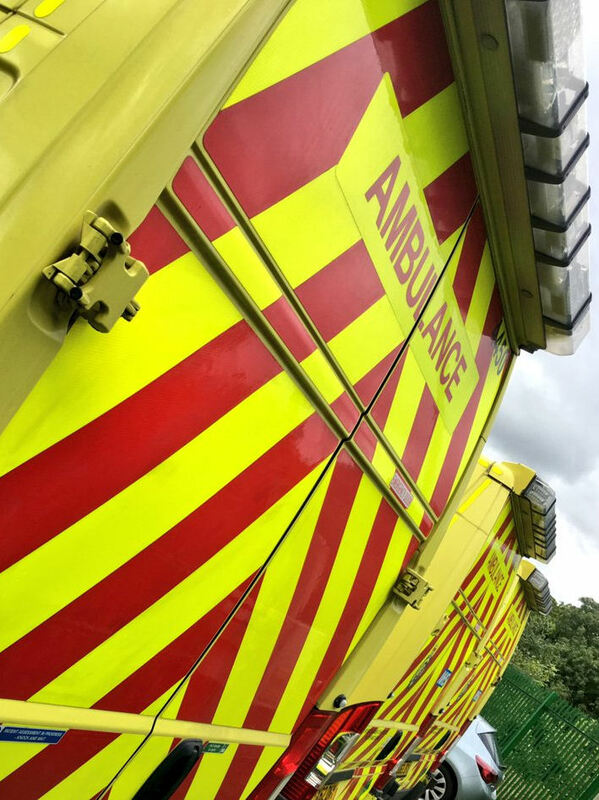 West Midlands Ambulance Service received a call to Bishops Bowl Lakes on Station Road, Southam, at 6.12pm last night (Thursday) following reports of a patient in the water. Three ambulances, two paramedic officers, the Trust’s Hazardous Area Response Team, the Midlands Air Ambulance from Strensham and the Warwickshire and Northamptonshire Air Ambulance Critical Care Car attended the scene. A West Midlands Ambulance Service spokesman said: “On arrival at the scene, crews were told a teenage male had got into difficulty in the water. “Ambulance crews worked closely with Warwickshire Fire Service and Warwickshire Police to begin searching for the teenager. “Sadly, all of our resources were stood down for the night without the patient having been found. “Specialist police water rescue teams have returned to the site this morning to continue the search. “The family of the missing teenager continue to be supported by specialist officers from Warwickshire Police. Wednesday 25th July 2018 –9.45am – Claire Brown. The Trust’s latest recruitment drive to find the life savers of the future, which closed at midnight, has captured the interest of almost 20,000 people. Since the job opportunity opened on NHS Jobs on Tuesday last week, 19,766 people viewed the vacancy. At the stroke of midnight last night, the vacancy officially closed and, the Trust’s recruitment team are now starting the task of processing an incredible 655 applications. Sadly, a further 714 applications were rejected due to people not meeting the criteria. The Trust’s Recruitment Manager, Louise Harris, said: “After the success of our social media presence and TV programmes like Ambulance, 999 On The Frontline and Inside the Ambulance all featuring our staff here in the West Midlands, the profession has never been so high profile and well respected. “Our social media channels on Twitter, Facebook and Instagram (@officialWMAS) have seen loads of people asking for more information about the vacancy and it’s quite unbelievable how many people have taken the time to look at the role of student paramedic. As an ‘earn as you learn’ scheme, it opens up possibilities to a wide range of people in the region and beyond. Tuesday 24th July 2018 – 1.00pm – Claire Brown. West Midlands Ambulance Service can confirm that it was called to Astbury Avenue, Smethwick shortly before 10.30am today (Tuesday). An ambulance, a paramedic officer, the Trust’s Hazardous Area Response Team (HART) and a Critical Care Car from Midlands Air Ambulance responded to the scene. Crews arrived to find a woman, in her 40s, who had suffered serious chemical burns to her face following an attack which is believed to have taken place in the vicinity of Northbrook Street in Ladywood. The woman was given pain relief to help ease her discomfort whilst her face was fully irrigated with water to help remove the unknown substance. She was then transferred by land ambulance on blue lights to hospital for further specialist burns treatment. Tuesday 24th July 2018 – 10.30am – Claire Brown. A motorcyclist and a pedestrian received trauma care by ambulance staff after being involving in a collision with a car which fled the scene. West Midlands Ambulance Service received a 999 call to reports of a road traffic collision on Broad Street in Kidderminster shortly before 4.00pm yesterday (Monday). Two ambulances, a paramedic officer and the Midlands Air Ambulance from Strensham attended the scene. A West Midlands Ambulance Service spokeswoman said: “Crews arrived to find a pedestrian and a motorcyclist who had reportedly been involved in a collision with a car which had failed to stop. Upon assessment by ambulance staff, the pedestrian, a man in his 60s, was found to have sustained significant and potentially life-changing injuries which required advanced trauma care at the scene. The emergency team worked to administer pain relief before treating and stabilising his serious injuries. The man was then fully immobilised before being airlifted to Queen Elizabeth Hospital Birmingham for further emergency care. “The motorcyclist, a man in his 20s, suffered a number of abrasions to his body. He was given pain relief to ease his discomfort before ambulance staff dressed his wounds. The man was then taken to Worcestershire Royal Hospital for further checks. Thursday 19th July 2018 – 5.20pm – Murray MacGregor. Two people have been taken to a major trauma centre after a crash that left one patient trapped for over an hour. The incident happened at about 10.50am this morning on the A3400 Shipston on Stour to Tredington road. The Warwickshire and Northamptonshire Air Ambulance, two ambulance crews and a paramedic officer were sent to the scene. A West Midlands Ambulance Service spokesman said: “On arrival, ambulance crews found two cars that had both suffered front end damage. One of the cars was off the road in a hedge and both drivers were trapped. “Ambulance staff worked with firefighter to extricate the patients. “The first, a middle aged woman was able to get out of the vehicle after firefighters removed the door. She was treated for potentially serious injuries and was airlifted to University Hospital Coventry & Warwickshire. Thursday 19th July 2018 – 4.30pm – Murray MacGregor. An elderly walker who was injured after a fall has been airlifted to hospital. The incident happened at just after 9.00am on The Wrekin, near Telford between Halfway House and Devils Gate. An ambulance and a paramedic officer in a 4×4 were initially sent to the scene. An off duty paramedic also stopped to offer assistance. A West Midlands Ambulance Service spokesman said: “The walker, who was in his 80s, had fallen and landed awkwardly. The crew and paramedic officer were able to make up to the walker in the 4×4 but after assessing the patient requested an air ambulance be sent and the Midlands Air Ambulance from Cosford was dispatched to the scene and landed on the path. Wednesday 18th July 2018 – 9.25am – Murray MacGregor. Ambulance bosses are once again warning about the dangers of using accelerants on barbecues after three people were injured in an incident. It happened in the village of Hopton Wafers in Worcestershire at about 6.40pm on Tuesday evening. An ambulance, the Midlands Air Ambulance from Strensham and the West Midlands CARE Team doctor were sent to the scene. A West Midlands Ambulance Service spokesman said: “The injuries were caused when accelerant was put onto the barbecue resulting in a flash back. An elderly man suffered very serious burns. He had active cooling before burns dressings were put in place. He was given pain relief and fluid therapy before being airlifted to the burns centre at Queen Elizabeth Hospital Birmingham. A middle-aged man had also suffered burns. He was taken to the same hospital by land ambulance with the doctor travelling with the crew. He had also had active cooling and was given pain relief. An elderly woman was treated at the scene for less serious burns who had gone to aid the other two patients. She was discharged at the scene after assessment. Wednesday 18th July 2018 – 9.05am – Murray MacGregor. A motorcycle rider has died after a crash last night (Tuesday). The incident happened at about 9.00pm at the roundabout where The Ringway and Comberton Hill meet in Kidderminster. A senior paramedic officer, a paramedic officer and an ambulance were sent to the scene. A West Midlands Ambulance Service spokesman said: “Crews arrived to find the rider in the subway in the middle of the roundabout. Want to find out more about your ambulance service? Come along to our Annual General Meeting later this month and hear how we provide an outstanding service to our patients in the West Midlands. Tuesday 17th July 2018 – 12:45pm – Murray MacGregor. A motorcycle rider has been airlifted to a major trauma centre after crashing this morning. The incident happened at about 7.40am on Worcester Road by Hartlebury Trading Estate in Hartlebury, Worcestershire. A number of passers-by including off-duty nurses and a firefighter came to the man’s aid before an ambulance and then the Midlands Air Ambulance from Cosford arrived. A West Midlands Ambulance Service spokesman said: “The staff were told that it was a single vehicle crash involving a lamppost. “The rider, a man in his 30s, had suffered some nasty injuries. Working together, the crew and air ambulance staff provided pain relief before applying splints after manipulating the injuries. “The air ambulance, which had landed in the road nearby, then flew the man to the major trauma centre at the Queen Elizabeth Hospital Birmingham. Tuesday 17th July 2018 – 7.45am – Murray MacGregor. Ambulance staff are urging youngsters to wear a cycle helmet when riding off road in the woods. The call comes after a youngster was anaesthetised and taken on blue lights to a paediatric major trauma centre after crashing. The incident happened in Perry Wood Local Nature Reserve, off Redfern Avenue in Worcester at about 3.30pm on Monday afternoon. An ambulance, a paramedic officer and the Midlands Air Ambulance from Strensham, with a doctor and critical care paramedic on board, were sent to the scene. A West Midlands Ambulance Service spokesman said: “The incident happened on a steep slope about 50 yards into the woods when the boy crashed while going down the slope leaving him unconscious. “The boy suffered a head injury. After being assessed by the doctor, the decision was taken to anaesthetise the youngster before he was taken on blue lights by road to Birmingham Children’s Hospital. “While it is clearly a matter for the individual or their parent/guardian, our view is that a cycle helmet can help prevent injury and could have resulted in a different outcome in this case. Thursday 12th July 2018 – 4:30pm – Murray MacGregor. A woman has died and a man has suffered potentially seriously injuries after a stabbing incident in the Small Heath area of Birmingham. West Midlands Ambulance Service was called to Aubrey Road at 11.00am this morning (Thursday). Two ambulances, a paramedic officer, the Midlands Air Ambulance Critical Care Car, the Midlands Air Ambulance from Cosford and the Warwickshire and Northamptonshire Air Ambulance were all sent to the scene. A West Midlands Ambulance Service spokesman said: “On arrival, ambulance staff found an 86 year woman who had suffered very serious stab wounds. Ambulance staff immediately started treating her, but sadly it was not possible to save her and she was confirmed dead at the scene. Thursday 12th July 2018 – 9.30am – Murray MacGregor. Ambulance staff faced a barrage of 999 emergency calls after the final whistle in the England Croatia match as some fans struggled to come to terms with the loss. 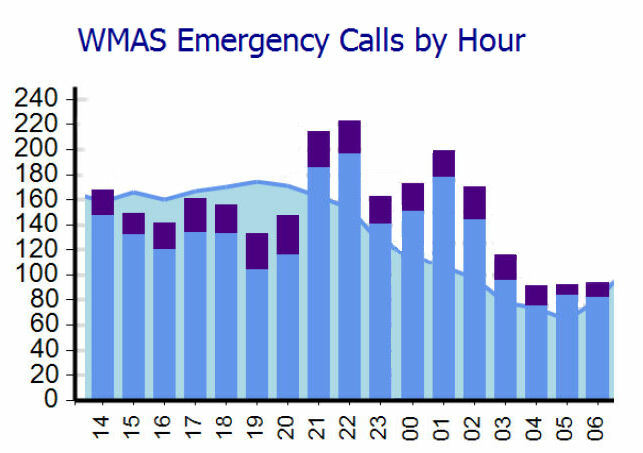 Call numbers rose by 15% compared to the same time the previous week with over 1100 calls received between 9.30pm and 4.30am. Assistant Chief Ambulance Officer, Nathan Hudson, who was in control of the Trust, said: “Almost immediately after the final whistle, the phone lines lit up. “We were called to over 40 reports of assaults in the aftermath of the match. We also dealt with a number of serious RTCs and other drink related incidents with people falling over, drink fuelled cases of bravado leading to injuries. Sadly, we also saw a number of cases of domestic violence. An ambulance and a paramedic officer were sent to reports of a large fight in Beacon Road, Great Barr, Birmingham at 9.40pm. In total, 8 calls were received about the disturbance. A man in his 40s was taken to hospital was facial injuries and numerous abrasions. A second man who was being assessed walked off after becoming aggressive towards the crew. The Trust was called to reports of a man who had been ‘surfing’ on top of a moving car in Barn lane, Olton, Solihull at 9.50pm. An ambulance and a paramedic officer were sent to the scene. A man in his 40s was treated for head and arm injuries. He was treated at the scene before being taken to hospital. The Trust was called to the canal opposite Walkabout in Broad Street in Birmingham at 10.30pm to reports of 16 people having jumped into the water. A paramedic officer and an ambulance were sent to the scene. After assessing those there, they were all discharged on scene. Nathan Hudson, added: “The high levels of demand continued through until around 4.30am before returning to levels that we would normally have expected to see. Thursday 12th July 2018 – 8.40am – Claire Brown. Despite the best efforts of ambulance staff last night, they were unable to save the life of a motorcyclist on the M54. 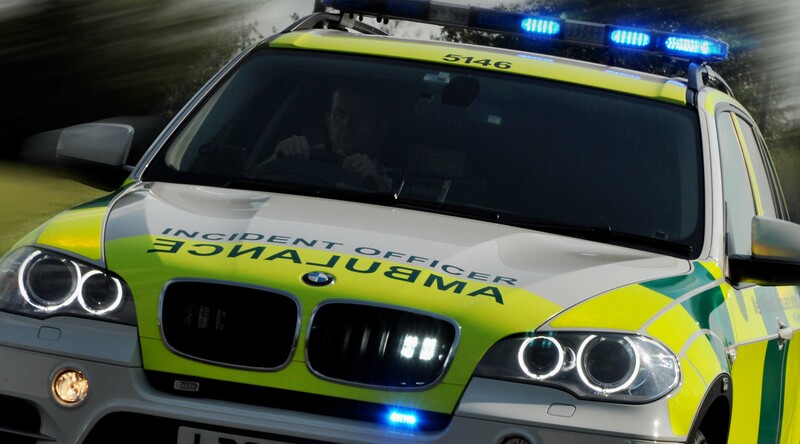 West Midlands Ambulance Service was called to reports of an RTC involving a car and a motorcyclist on the eastbound carriageway of the M54 between junctions 3 and 2 shortly after 11.00pm last night (Wednesday). An ambulance, a paramedic officer, a MERIT trauma doctor and two senior paramedic officers responded to the scene. A West Midlands Ambulance Service spokeswoman said: “When ambulance staff arrived they found a motorcyclist, a man, in cardiac arrest. The team worked quickly to administer advanced life support on scene but sadly nothing could be done to save the man and he was confirmed dead a short time later. Thursday 12th July 2018 – 7:45am – Murray MacGregor. A motorcyclist has died after a collision with a car. The tragic incident happened in Adderley Road outside Adderley Park in the Saltley area of Birmingham just before 6.50pm last night (Wednesday). An ambulance was on scene in just over five minutes and was back up by a second ambulance, a paramedic officer and the Warwickshire and Northamptonshire Air Ambulance. A West Midlands Ambulance Service spokesman said: “The exact circumstances of what had happened were not clear, but on arrival, ambulance staff found the motorcyclist in cardiac arrest. “Crews carried out advanced life support at the scene but sadly, it was not possible to save the man and he was confirmed dead at the scene. Friday 6th July 2018 – 9.30am – Claire Brown. Despite the best efforts of ambulance staff yesterday, a motorcyclist sadly died following an RTC in Atherstone. West Midlands Ambulance Service was called to Nuneaton Road in Mancetter, Atherstone, shortly after 4.30pm yesterday (Thursday). An ambulance, a paramedic officer and the Warwickshire and Northamptonshire Air Ambulance with a doctor on board were responded to the scene. One of the Trust’s Patient Transport Services (PTS) crews were passing the incident and stopped to render aid to assist emergency colleagues. Friday 6th July 2018 – 8.20am – Claire Brown. A quad biker suffered serious injuries after ending up 20ft down a steep embankment in Rowley Regis yesterday. West Midlands Ambulance Service was called to Moor Lane, near to Rowley Regis Hospital at 4.50pm (Thursday). A paramedic officer, an ambulance, HART Paramedics and the Midlands Air Ambulance from Strensham with a doctor on board attended the scene. A West Midlands Ambulance Service spokeswoman said: “Emergency services arrived to find the quad biker, a man in his 60s, who had ended up 20ft down a steep embankment after coming off the road. “Upon assessment ambulance staff found he had sustained potentially serious injuries and administered treatment to help stabilise his condition on scene. “Due to the man’s precarious position on the steep gradient the team of medics decided to fully immobilise the man and placed him into a Multi Integrated Body Splint (MIBS), a material stretcher with lifting handles, to ensure he could be moved easily and safely. Ambulance staff and the fire service then worked as a team to carefully lift the man up the slope using rope rescue techniques where he was then transferred to the awaiting land ambulance and conveyed on blue lights to Queen Elizabeth Hospital Birmingham. Thursday 5th July 2018 – 8.45am – Murray MacGregor. A motorcyclist has suffered serious injuries after a collision with a car. It happened on Almond Tree Avenue in Coventry at about 8.40pm last night (Wednesday). An ambulance, a paramedic officer and The Air Ambulance Service Critical Care Car with a doctor on board attended the scene. A West Midlands Ambulance Service spokesman said: “On arrival ambulance crews found the rider partly under the car. “The man was immobilised, given pain relief and had a splint applied before being taken on blue lights to the major trauma centre at University Hospital Coventry & Warwickshire with the doctor travelling with the crew. 70 years of change but one shared belief – the NHS would be hugely missed. Wednesday 4th July 2018 – 8.30am – Murray MacGregor. 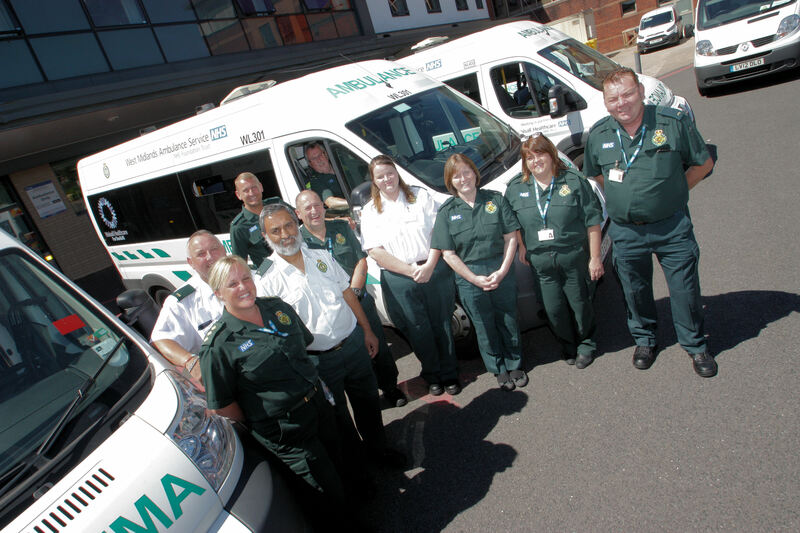 West Midlands Ambulance Service and Walsall Healthcare NHS Trust have agreed a two year extension to the non-emergency patient transport service (PTS) contract which will mean a doubling of staffing and vehicle numbers for WMAS. The hospital trust awarded the contract last month with the new service starting to come into place from this week. Daren Fradgley, ‎Director of Strategy & Improvement at the hospital, said “We are delighted that we have been able to reach an agreement with WMAS for the next two years. We are committed to working together to make improvement to the service for our patients and continue the high quality service. WMAS Non-Emergency Services operations Delivery Director, Michelle Brotherton, said: “This is excellent news for the West Midlands Ambulance Service and re-affirms our commitment to try and grow our PTS services. “It has been a difficult few months for the staff who were unsure what would happen. Throughout the period they have continued to work hard and ensure patients get the highest standard of care possible, for which I applaud them. Tuesday 3rd July 2018 – 2.10pm – Claire Brown. Ambulance staff provided advanced trauma care to a cyclist after a collision involving a car in Birmingham earlier today. West Midlands Ambulance Service was called to Fairfax Road in Northfield at 10.18am to reports of a collision involving a car and a cyclist. An ambulance, two paramedic officers, a Midlands Air Ambulance Critical Care Car, the Midlands Air Ambulance helicopter from Cosford with a MERIT trauma doctor on board and a second BASICS doctor were sent to the scene. A West Midlands Ambulance Service spokeswoman said: “When ambulance staff arrived they found a cyclist, a man, who was in a serious condition and being given excellent first aid by bystanders which included an off-duty St John Ambulance volunteer. “Ambulance staff and the doctors quickly commenced treatment on scene, administering advanced trauma care to help stabilise the man’s condition before he was taken by land ambulance on blue lights to Queen Elizabeth Hospital Birmingham. The hospital was pre-alerted to the arrival of the man who was said to be in a critical condition at the time. Tuesday 3rd July 2018 – 9.25am – Jamie Arrowsmith. Despite the best efforts of ambulance staff, a man has died in Coventry in the early hours of this morning. West Midlands Ambulance Service was called to reports of a collision between a car and a pedestrian on Barras Lane, Coventry, shortly before 12.40am and sent two ambulances, a paramedic officer and the Warwickshire and Northamptonshire Air Ambulance Critical Care Car to the scene. A West Midlands Ambulance Service spokesman said: “On arrival, crews discovered a man who had suffered serious injuries in the collision and was in cardiac arrest. “Ambulance staff immediately began CPR and also administered advanced life support which continued en-route to University Hospital Coventry and Warwickshire. Tuesday 3rd July 2018 – 8.00am – Claire Brown. A man has sadly died, and a boy has suffered serious injuries after the motorcycle they were riding collided with a lorry last night in Warwickshire. West Midlands Ambulance Service was called to Purley Chase Lane, near the quarry, in Mancetter shortly after 7.30pm last night (Monday). Three ambulances, a paramedic officer, the Midlands Air Ambulance from Tatenhill and a medic from East Midlands Ambulance Service responded to the scene. A West Midlands Ambulance Service spokeswoman said: “When crews arrived they found a motorcycle which had collided with a lorry. The motorcyclist, a man, was in cardiac arrest and was already being given CPR by police officers. Ambulance staff took over resuscitation and commenced advanced life support at the scene. Sadly, despite their best efforts, nothing could be done to save the man and he was confirmed dead a short time later.